It was very inspiring to see the solidarity and the common effort to re-establish the society/economy of Japan after the tsunami/earthquake disaster in March. As a result of these tough times, the market has shifted focus from quantity to quality, and towards the competitive advantages of being 'made in Japan'. A fascinating movie about Sayaka Ganz's creative process can now be watched on her own website. Sayaka masters a special skill to re-use plastic objects, which she finds in thrift shops. The process shows Sayaka's incredible technique as an artist and her amazing world of imagination. 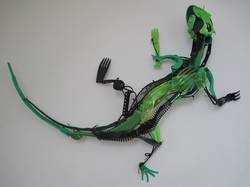 Check out Sayaka Ganz's coming exhibitions on her website. 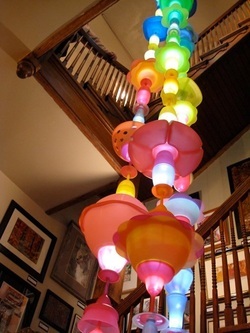 Artist Sayaka Ganz: Plunge Installation! 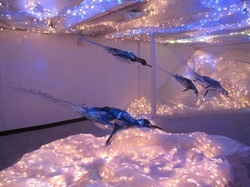 "Plunge" by Sayaka Ganz was exhibited in amazing settings, which added new life and movement to the diving penguins. The art piece "Forrest" by Sayaka Ganz is now exhibited at Susquehanna Art Museum.